FOR THAT ADDITIONAL PART OF THE TOUR, THAT YOU DO NOT WANT TO DO. FOR THOSE GROUPS THAT WISH TO TAKE THE (Optional) "AMISH HOME TOUR". 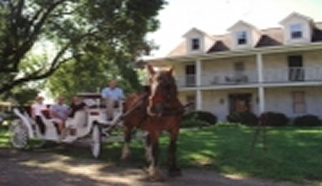 BY the "Amish Country Tours "
OUR HISTORIC "OLD HOTEL", NOW, THE COUNTRY COLONIAL B&B. (AT YOUR EXCLUSIVE DISPOSAL FOR AT LEAST 2 HOURS.) While most shop, your Folks can take turns riding. EVERYONE WANTS A PICTURE TOO, SO THEY CAN SHOW, YOUR NEXT TRIP'S PASSENGERS, what they can look forward to on your next trip. IF YOU TAKE THE "HOME TOUR"
IF YOU, TREAT THEM -REALLY SPECIAL- AND GIVE THEM EVERYTHING INCLUDING THE "AMISH HOME TOUR"
AND A GREAT CARRIAGE RIDE EXPERIENCE! EXPENSES ARE HIGH ENOUGH! DON'T YOU DESERVE A BETTER "BOTTOM LINE" WHILE GIVING YOUR GROUP A REALLY MEMORABLE EXPERIENCE?